From the Antony Gormley ensō adorning its cover to the final strains of a chamber orchestra raag, the restless shade of contemplative exploration haunts an album which includes seminal works by Vasks and Pärt. The vision of O/Modernt (Swedish for ‘Un/Modern’) is to use creative programming to stimulate an active and innovative listening that enables the listener to become more aware that he or she is indeed the prism through which musical sounds are brought to life. Let me begin by telling a short anecdote. I was teaching a music history class in which we were enjoying a glorious Mozart aria, when an eager student with great conviction suddenly exclaimed, ‘Ah, but he got that from Puccini!’ Sheepish giggles broke out in the room, but before they could develop into full-blown laughter I intervened with one word: ‘Exactly!’ A bemused silence swept across the class, before a more extended discussion ensued. This little story illustrates something we all know well: we can never hear the music of Vivaldi, Mozart or indeed any past composer in the same way as that same music was heard when it was new. One reason for this is that the music we hear, whether ancient or modern, local or exotic, passes through an idiosyncratic filter, unique to each of us, made up of every sound, every noise, every piece of music that has ever previously passed through our ears. We may not actively have listened to much of this acoustic activity—in fact, I would say we may very often have tried not to listen to it!—but it’s present, nevertheless, and it locates our individual listening in our own particular time and place. This, of course, extends to our emotional and spiritual engagement with the music we encounter: it is all refracted through our own unique prism, the total fabric of our lives. White Light hopes to create conditions in which you, the listener, can engage in a very active kind of listening. With its juxtaposition of styles and genres, it challenges habitual expectations and perceptions, turning the familiar into something strange, while making the strange seem uncannily familiar. At the end of the class discussion mentioned above another student said, ‘Now I understand what Barthes meant when he talked about 'the death of the author'.’ Comparably, I hope that, as you listen to the present album, you will become active participants in its creation. After spending six weeks meditating in India with his mentor and sitar teacher, Ravi Shankar, George Harrison wrote Within you without you. The lyrics are an eloquent expression of Vedic philosophy: the flow of life is each individual’s gift to realise within themselves that through the ‘wall of illusion’ (or maya, the illusory nature of existence) ‘we’re all one’, and that love is the gateway through which we can ‘glimpse this truth’. In the first line of the song Harrison invokes ‘the space between us’. Is this a space that divides or connects us? The space of music, I believe, offers one answer. A long and venerable tradition, encompassing such diverse figures as Racine, Lessing, Herder and Schopenhauer, has enshrined the notion that music is the temporal art par excellence: a ‘certain organization in time, a chrononomy’, as Stravinsky put it. Schopenhauer even went so far as to say that ‘music is perceived solely in and through time, to the complete exclusion of space’. Despite its temporal modality, however, whenever we are called upon to talk about music we tend to rely almost exclusively on the language of rudimentary spatial relations such as ups and downs, verticals and horizontals. The terms don’t refer to the real space in which musical sounds come into being, but rather indicate the graphlike space of tonal relations. This is a geometric, two-dimensional spatialization of music—a way of mapping a flat picture plane deriving from optical reality onto a temporal art. But what if we try to understand the space of music not in relation to optical or geometrical concepts, but as a purely auditory encounter? Heard rather than seen, a piece of music opens up its own individual sonic space, fashioned from its particular resonances, to create what we might think of as a reverberating womb that we are invited to inhabit. The experience of this auditory expanse is neither an illusion nor a metaphorical shadow of visual space but a striking reality. Learning to be receptive to the numinous fullness of this sonorous reality, both in relation to individual pieces and to music more generally, is a lifelong journey for listener and performer alike. In today’s overpolluted aural landscape we are constantly surrounded by noise representing itself as music: it fills our shopping malls, elevators, restaurants and even our homes. It washes over us like ‘endless rain’ flowing into ‘a paper cup’ (Across the universe). It is a desensitizing fog that eventually numbs our ability to engage dynamically with the music we actually choose to listen to. Relearning the art of active listening and aurally embracing the reality of music with heightened awareness reconnects us with the flow of sounds, allowing them to be a vehicle of sustained presentness. Conversely, an overly intellectual engagement with music is equally detrimental to our immediate experience of its resonant sweep. Endeavouring to extract meaning from the fundamental auditory sensations, we mediate the listening process through conceptual frameworks, fabricating abstract thoughts that draw us away from the flow of sounds. Unlearning this conceptual overlay in the act of listening or performing grants us access to the flux of musical space. The twofold act of listening attentively while simultaneously and spontaneously losing ourselves in the auditory reality of music is the doorway to what Bergson called ‘duration’. Past, present and future are bound together in an act of creative freedom—a continuous elaboration of the absolutely new. My soul yearns after the Lord, and tearfully seeketh Him. How canst I not seek Thee? and [let] my soul love Thee. and unto tears do I yearn for Thee. My music was always written after I had long been silent in the most literal sense of the word. When I speak of silence, I mean the ‘nothingness’ out of which God created the world. That is why, ideally, musical silence is sacred. Silence is not simply given to us, but in order that we may draw sustenance from it. This sustenance is no less valuable to me than the air I breathe. There’s an expression: to live on air and love. I’d like to rephrase this: if you approach silence with love, music may result. A composer often has to wait a long time for this music. It is this reverent sense of expectation that constitutes the brief silence of which I am so fond. Pärt’s new musical language fuses an austere minimalistic diatonic tonal vocabulary with imitations and adaptations of the evocative tolling of bells—the quintessential sound of religious ritual, particularly in the Russian Orthodox Church which Pärt joined in the 1970s. Striving to create a musically notated imitation of the rich composite of overtones produced by bells, Pärt worked out what he called his ‘tintinnabular’ style (from the Latin tintinnabulum, meaning ‘bell’). One of the purest examples of this mode of writing, in the sense that its effect is achieved with a bare minimum of material, is Cantus in memoriam Benjamin Britten. The chiming of a pianissimo bell (campana) breaks the silence and opens up a sacred space rich in liturgical overtones. What follows is essentially a mensuration canon on a descending A minor scale (Aeolian rather than melodic or harmonic minor) and its attendant tintinnabular pitches—notes belonging to the A minor triad below and above the scalar movement. It has five layers of tempo, each entering in turn, and each one an octave lower and twice as slow as the one before. The double basses enter last, sixteen times slower than the first violins. The tintinnabular style and the canonic technique question the temporal-spatial nature of music. The vast majority of music we listen to is tonal, and the triad is part of the complex hierarchy of chordal relations that form the musical language we know as tonality. In the context of these relationships the triad is employed to do this and that, to lead here and there, and to resolve the resulting tensions. By contrast, triads in the tintinnabular style are divested of dynamic agency; more specifically, the dissonances that would usually be heard working against the chordal framework do not create friction. Liberated from the constraints of voice-leading and the need to guide us towards the stable tonic, the shifting chords eschew the potential energy of dissonance. Rather than straining to achieve resolution, they exist in and for themselves—statically, as it were—simply creating an envelope, or womb, of sound. As listeners we are persuaded not to hear the sonic present as a point to which and from which the music drives in fulfilment of a tonal teleology, but as the point at which all exists in the fullness of its sounding: there is no past and no future, just the eternal present. The temporally directed motion of tonal hierarchies becomes a spatial hypostatization of the sounding moment. In a similar vein, Pärt sets in motion a scalar canon that could theoretically continue ad infinitum, once again ingeniously avoiding any teleological closure. It is only the limitations of the instruments’ ranges that set a limit to the spatial voyaging and bring the work to a close. If we leave behind the emotional drive of time and allow our awareness of the reverberating space to be the primary mode of perception, the music becomes, as mentioned above, a vehicle of sustained presentness. But for her alone, whom I wholly give you. Mother of God is part of the seven-hour epic, The Veil of the Temple, a work Tavener considered to be his supreme achievement. He called it his musical attempt to pierce through the ‘wall of illusion’ and share the message that, behind the veil, all is one: ‘all religions are in their transcendent way inwardly united beneath their outward form.’ In this recording, the work is prefaced by overtone singing, the physical embodiment of white light (the fundamental tone) being refracted through a prism (the singer’s throat). Tavener was heavily influenced by the ragas of Indian music and their attendant philosophy, and with this in mind it occurred to me in the middle of the recording sessions that, while the orchestra plays the hypnotic chords of Mother of God, Soumik Datta could embellish them with an improvised sarod solo. The complex space between man, nature and the beauty of life on the one hand, and the imminent moral and ecological destruction of the world on the other, is a powerful agent in the musical narratives of the Latvian composer Pēteris Vasks. At its dramatic heart, his music powerfully articulates the duality of human nature. The violin concerto Distant Light is one of the most heart-rending musical expressions of this duality. The single long movement fluctuates between extremes of lyrical beauty and dramatic violence, brooding melancholy and ecstatic joy, demonic waltzes and angelic cantilenas, love and despair. The piece culminates in a final waltz that poses an unavoidable and pressing question. What do you hear in this final passage—existential irony, nostalgia, or perhaps a glimmer of hope? In Across the universe John Lennon contemplates the yogic way of negotiating and even transcending the space between the dualities invoked by Vasks. Written while staying at Maharishi Mahesh Yogi’s ashram, the song is, like Within you without you, deeply indebted to Indian thought. In this state of non-duality (Advaita), realizing its oneness with ultimate reality (Brahman) and ‘limitless undying love’ the individual soul (Atman) ‘shines … like a million suns’. A little over a thousand years ago, scribes in the monasteries of southern Europe began marking lines and dots above their plainchant texts in order to trace the ebb and flow of the sung melodies. It signalled the end of music in the west as an exclusively oral tradition and ushered in the age of musical literacy. Neumatic notation, as it was called, did not indicate intervallic relationships and therefore acted solely as a mnemonic device, reminding singers of melodies they already knew. In the early part of the eleventh century, however, the neumes were arranged diastematically (so their vertical positions represented pitches) on the lines and spaces of a cleffed staff (invented, according to tradition, by the monk Guido of Arezzo). At that point music could finally be transmitted without any oral intervention—soundlessly, as it were. These lines and spaces are the basis of the notational forms that are the bedrock of the western art tradition. Innocently enshrined in them is also the dual or binary thinking prevalent in western thought as a whole—an either/or mentality that leaves little room for the ambivalence that might break the dichotomy down—for a note is placed either on the line or in the space, and that difference demarcates a defined musical interval. Indian music, on the other hand, thrives on exploring the minute gradations that exist between the intervals taken for granted in the west. In the opening section of Raag Bhairavi, for example, there is an extended melodic improvisation called an alap. It is, as I learnt, the art of ‘tasting’ the notes of the raga, a melodic mode in Indian music. Significantly, the literal translation of raga is ‘colouring’ or ‘tingeing’, and the tasting process reaches beyond the sounding notes to explore how they are connected, how they are arrived at, withdrawn from, embellished and re-imagined—in short, it is ‘the space between’ that colours the raga. it is often considered the queen of all melodies. Like many other ragas, it is assigned to be played at a particular time of the day and in the case of Bhairavi, that time is dawn. However, its soft komal (‘flattened’) notes and its lilting, graceful stride have bestowed upon it a timelessness. Much like the queen in a game of chess, Raga Bhairavi can freely roam the board, unbound by the strict rules of the raga world. The scale uses seven notes including a flattened second, third, sixth and seventh and could be compared to the Phrygian mode in western music. But to invoke the true sense of the raga, a performer must flirt with the accidentals and grace notes that span all the black and white keys of a piano. Much like white light which carries all the colours within a spectrum, embedded within Raga Bhairavi are all the twelve notes and beyond. Beyond the notes, Bhairavi is like a map of the human experience. It is a raga that grows with you, generating new phrases as we live, learn, make mistakes and journey on. As there are only a few rules to the raga, the artist must decide how to find its internal balance—a balance that must be found in life first, before its application to music. In many ways, we can think of this elusive raga as a glass mirror that reflects, grows and meanders with us throughout our time on earth. The art of improvising lies at the very heart of Indian music. 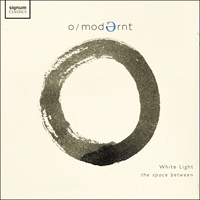 Along with the Indian music included on White Light, the album contains interspersed improvisations that act as musical bridges between different musical worlds. On the front cover of the album is an ensō drawn by Antony Gormley. In Zen Buddhism the ensō is a circle that is hand-drawn in a fluid brushstroke to express a moment when the mind is released, leaving the body free to create. The unique qualities of each and every ensō—the way it curves, its texture, any blemishes or asymmetries, its simplicity, grace and even its imperfections—reveal the mind and character of its creator and the context in which it was made. The art of improvising is likewise a window onto the inner landscape of the improvising artist. In both cases, the more one is able to abandon oneself in the act of creative freedom, the clearer the window becomes, and the more one reveals both of oneself and of the music that is spontaneously made. But in neither case is it a one-way experience: viewers and listeners are also invited to let go, to enter the visual or musical spaces in order to explore reflections of themselves. Let us return to the question posed at the beginning of this note. Is the ‘space’ of Within you without you one that divides or connects? The discoveries of modern science have radically changed our view of the world. The understanding of the universe as a mechanical system composed of elementary building blocks has been superseded by a holistic model highlighting the complex web of interdependent dynamic relationships that make up the world. (Notwithstanding his great admiration for Schopenhauer, Einstein would have been quick to point out that neither time nor space can exist to the complete exclusion of the other.) The auditory spacetime I have been exploring is likewise a web of vibrant interconnections, and experiencing this musical space offers an intuitive understanding of the world around us in a process that echoes the ancient Indian philosophy of Nada Brahma: ‘The world is sound, sound is God’. In conclusion, let me circle back to the name, which is also a kind of logo, that runs like a leitmotif through the concepts we have been discussing: O/Modernt. Besides the self-explanatory combination of ‘old’ (Swedish omodernt) and ‘new’ (Swedish modernt), divided by the solidus (/), there is another hidden meaning. O/Modernt is abbreviated as OM, which in Indian thought represents the primordial vibrational sound from which the universe emanated—a mantra chanted by millions the world over. The backwards, upside-down, lower-case E (‘schwa’, from the Hebrew shva via German Schwa) signifies the ego and provides a gentle—even subliminal—reminder that every one of us must strive to evade the ego’s shrill and persistent claims, turning back to lose ourselves in the ever-present rhythmic energy of the sounding NOW. This is the vision and aspiration of O/Modernt—to inspire performers and listeners simultaneously to rediscover the kaleidoscopic colours of the present moment and, by reversing the prism, lead them to the experience the all-encompassing white light which is the space that connects us all. What is the relation between acting and receiving? An inclination to oppose the two is at the root of a widespread modern culture, still dominant today, of interpreting texts strictly in their original historical contexts and of performing music ‘authentically’—in each case allowing authorial intention to be the determining factor. Agency relinquished to the author or composer, the reader, performer or listener must come as a blank slate, having been stripped of her baggage, ready to receive without prejudice. To interpret or listen creatively, it follows, must be to impose something alien on the original. Either the listener recedes to give space to the voice of the composer, or the listener intrudes and buries that voice. Agency is competitive. Receptivity is passivity. White Light explodes this set of assumptions by overturning the opposition at its root. The deepening of receptivity is the deepening of agency. To listen well is to create. These are the theses it puts into performance. First, in the innovative tradition of O/Modernt, White Light juxtaposes and interweaves music from diverse traditions and genres: Indian, western classical and pop. In doing so, it magnifies what is always already going on whenever we listen, which is to listen actively, drawing contextually generated associations in order to render the music meaningful. But in White Light, unexpected context is provided for what we thought we knew, awakening surprising and illuminating associations to produce new meaning. We are made aware of the previously hidden agency in our reception, and this awareness enables both newly generative agency and heightened receptivity, as associations breed further imaginative associations. Meaning happens between things (as the Beatles put it, in ‘the space between us all’, Within you without you): the Indian and the classical do not competitively contain meanings that can only distort one another when brought into relation; they light each other up. The listener is creatively caught up in this light. Arvo Pärt’s analogy between a listener and a prism captures well the in-betweenness of meaning. But it also does odd things with agency and receptivity. While, on the one hand, agency is attributed entirely to the prism as that which ‘divide[s] the colours’, the prism is, on the other hand, completely passive to the action of light upon it. In identifying agency with passivity, is Pärt inviting us to rethink our own creative agency as a natural and organic part of the wider cosmos, in which to decide freely is to do so fittingly and thus receptively? The prism analogy draws attention to another noteworthy dynamic: the tension between the continuum of the colour spectrum and discrete colours within that spectrum. The same tension occurs between the signature glissando of the sarod and the discrete notes of the classical scale, and more generally between the sound continuum and its discrete harmonic vibrations. Pärt’s stepwise Cantus in memorium might be said to use the discrete notes of the scale precisely to create the impression of a continuum, while the glissandic, meandering fluidity of Raag Bhairavi is combined with tonal and rhythmic distinction to build towards a frenetic and precise communal climax. What the tension highlights more generally, however, is the impossibility of a purely literal, non-creative rendering of any piece of music. The phenomenon of the continuum (both tonally and rhythmically) means that there is ‘infinite’ choice at every moment. What White Light does so brilliantly is to liberate this infinity from the paralysis of either perfection or indifference on the one hand, and for the beauty and freedom of the fitting on the other hand. Improvisation takes this interplay between infinite possibility and fitting attunement to an extreme. Again, the relationship between agency and receptivity is crucial. Receptivity is multi-directional: to the traditions out of which one is improvising; to the idiosyncrasies of the instrument being played; to the natural, acoustic environment; and perhaps above all to one’s fellow improvisers. Here, most clearly of all, a deeper receptivity makes for a more persuasive creativity. The impersonal and passive language of ‘something magic happening’ reveals a freedom released from choice and an agency uncoupled from dominant assertion: agency as receptivity. Sound is always paired with silence. This is another of White Light’s themes. Creation is not in the sound over against the impotent silence, but is in the relation between them. On a competitive construal of agency, by contrast, activity is aligned with speech over against passivity as silence. To act is to drown others out. White Light draws attention not only to the creativity of the silent listener, but to the possibility of performing silence. The sounds are changed by the silent company they keep, just as the silence ‘speaks’ because of its situatedness between selected sounds. But more profoundly still, the silence out of which and into which these pieces are played alerts us to the fact that receptivity is ultimately more fundamental than activity. Our giving depends upon our having received. And what we have received, most basically, is our existence. The silent lyrics of Pärt’s Silouan’s Song move our discussion of creaturely agency into the (so far unspoken) context of divine agency. Creaturely seeking is a reception of divine searching; creaturely yearning of divine love. The absolute non-competition between the divine and the creaturely is captured by the creative ‘let it be’ of God. God’s creating is not imposition on what was already there, but a bringing into being of creaturely agency. Here, unilateral receptivity coincides with all the possibilities of creaturely freedom. The divine gift of our creaturehood is the ground of our capacity to give and receive in relation to other creatures, and to do so in such a way that we may, in attunement to one another, ‘partake of Thy Holy Spirit’, who is our shared and indivisible good.